It's the most wonderful time of the year...the Half Yearly Sale over at Nordstrom is going on now! Yeah! Yes! This is the ultimate fur vest and you can't beat the price! This is definitely going on my wish list! I adore this lace pattern...perfect for a winter wedding or a formal event! We have a lot of those coming up in the next couple months! These boots are so unique and fun! Love the taupe color and could see myself wearing them all winter long. 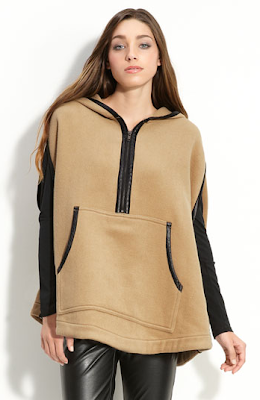 I've been craving a pretty cape! This one is casual, yet elegant. 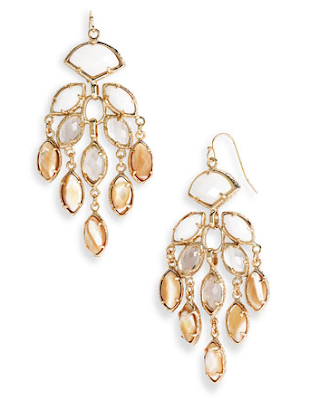 Who doesn't love Kendra Scott right now? These earrings are gorgeous and perfect for any occasion! Oh and have you been contemplating the colored denim look? Well, now's your chance! I definitely love the midi skirt trend...this skirt is stunning. Here's a less expensive, but equally as cute option! If you've been contemplating the Tory Burch Eddie Flat, you might consider these. They're equally as comfortable and stylish. 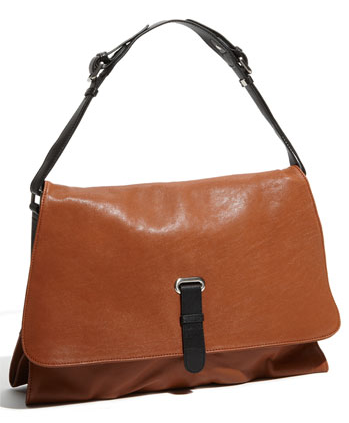 I love the ease of this handbag...great for the fall and at a price worth spending. So are you going crazy over the sale? Anything worth picking up? Do share! Love this sale! You know I love a good wedge boot and those are so cute and unique! I love the color of that bag and I am definitely on the hunt for a pleated skirt. Love the price of that one! oh great picks! Love that fur vest and the cape!! Love that black lace dress! Beautiful! SO excited to go shopping now! Especially since I have some gift cards to Nordys from my bday (: I'm hoping for either some sunglasses, a fun ring, or a new pair of flats! Great picks...that fur vest is amazing. These are great picks! I love that black lacey dress and those drop earrings - so pretty! Love all those boots! The best part of colder weather is wearing boots! Swooning over the 1/2 yearly sale... as always! Great picks!!! I'm with you and love the 1/2 yearly sale!! I think I may need to pick up that pleated skirt! Great choices, Natasha. That fur vest is fun! I love your picks! That fur vest is amazinggg. Love, love Nordstrom's big sales! The one thing I hate about living in NYC is the lack of Nordstrom. Ugh. I would die for the earrings and the J. Brand jeans! So fab. The family is heading to Nordstrom this weekend! They are also opening the first Von Maur in Atlanta on Saturday too!! Happy Shopping. thank you for the heads up on the sale... i may have to do a little online shopping since there is no nordstrom in nyc :( i LOVE the boots and purse you posted. i had my eye on that same black dress! love it. Loving what you are loving especially that first picture and those great Kendra earrings. Thanks for the reminder! I nearly forgot. And that would be no bueno. Love the Vince Camuto items...it would be a sin to not get atleast those two things. So happy that I just found your blog. Stop by & visit ours sometime. We'd love to hear from you! I'm trying to keep myself away from the sale, but this isn't helping! So much temptation! I don't think I miss anything more about the US than Nordstrom sales! Those boots are amazing! I need that vest...badly and the boots! i am in love with that black dress!!! love all of these!! especially the lace shift dress!! Oooo... love it! I love that black lace dress. I actually have a very similar one in navy from Banana Republic. Great list! I was at the mall tonight and didn't have time to go to Nordies. It was all I could do not to...I think it is still calling my name. That black dress is stunning. It would be perfect for my trip! 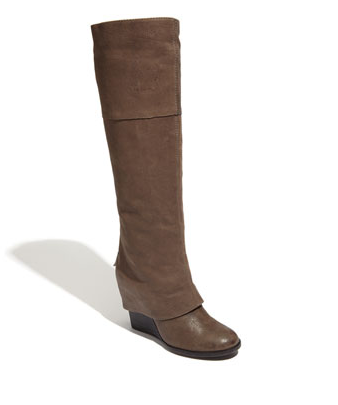 I've also been looking for a pair of wedge boots and those ones are pretty darn perfect. i need to get off my tuchas and go down there, but i've been too sick this week. and i will have more self-control! ;)PS Have you entered my dessert giveaway too? yes to everything. LOVE them! That dress and fur vest are gorgeous! And yes, who doesn't love Kendra Scott?! I just got my Sister-in-law a pair of earrings and a necklace for her b-day. Those earrings would make a great Christmas gift!! I just bought the Vera Wang flat at the sale the first day. Wearing them for the first time today. I do have the Tory flat like it, which are more comfortable, but can't pass up the $129 price tag! love your picks! especially the black lace dress. I love the black lace dress and chandelier earrings! I spent way too much money at this sale on Friday... and that was only online. I'm trying to refrain from going to the actual store. I definitely need to go there stat! I am majorly losing out on points if I don't buy anything! :) Love that black dress! I never met a skirt I didn't love. Which is why I cannot set foot in this store right now...must save for xmas...must save for xmas.